Movie Review: The enthusiastic moviegoers yearning for a rebirth of ‘Mad’ Max Rockatansky, immortalized by Mel Gibson in the early 80’s, can rest now. 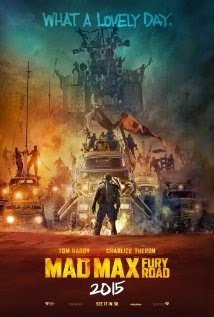 Director George Miller’s fourth post-apocalyptic road movie, “Mad Max: Fury Road”, is a meritorious follow up to the cult trilogy. The quiet loner Max, now played by Tom Hardy, continues his adventures in a dystopian Australia where the immense deserted landscapes sustain high-speed raging battles, most of them inventively crafted through futuristic vehicles, sufficiently freakish props, and gruesome faces. In the breathtaking opening scene, we observe Max being trapped and turned prisoner by the War Boys, the faithful army of the despot, Immortan Joe (Hugh Keays-Byrne), the one who, from his Citadel, controls all the water supplies of the area. Max becomes the official blood donor of Nux (Nicholas Hoult), an ambitious sick War Boy who, later on, will join him in the fierce rebellion against Joe, led by the one-armed soldier, Imperator Furiosa (Charlize Theron). Joe’s five beautiful wives, whose existence is resumed to giving birth, flee with Furiosa, who drives a heavily-armored War Rig toward East, looking for the ‘Green Place’, a vivid memory from her childhood. The tyrannical Joe reunites his army to chase the eight fugitives. I simply loved the guy hanging on the front of a car, insanely playing an electric guitar. Max, who keeps tormented by visions of his dead daughter and other ghosts, is the one to engender a risky and yet clever move: turn back to the Citadel. Mr. Miller takes a better advantage of the technology at his disposal, and yet the impetuously wild scenes never felt digitally manipulated. The elementary plot proves there’s no need for elaborate plots or subplots to set up a decent action-packed film. The power of cinema can marvel!